The past year has been a cursed one. It began with the death of David Bowie and proceeded to get worse on every level: political hysteria, impending ecological doom, the creeping encroach of net-connected tech into every corner of our lives, and a blurring of the lines between fantasy and reality now known as “post-truth.” It was not a great year for cinema — as the gazillion-dollar franchises increasingly shoved everything else to the margins — but the best films seemed both timely and truthful, speaking directly to the chaos of 2016. 10 Zootopia: The movie that neatly summed up everything that’s wrong with Hollywood in one line: “If you don’t try anything new, you’ll never fail!” With its cute anthropomorphic critters, I was expecting another “Madagascar,” but the fingerprints of former “Simpsons” writer Rich Moore are all over this, and the gags are razor-sharp. “Zootopia” uses clever foxes, dumb bunnies and timid sheep to deal with issues of race and diversity — and how people play the identity politics game — in a way that even a 6-year-old will get. 9 The Revenant/Embrace of the Serpent: Two beautifully shot (on location) deep-wilderness odysseys that seem to owe a lot to Werner Herzog, sharp jolts of colonialism and spirituality. “Embrace of the Serpent” follows a German ethnobotanist and an Amazonian shaman on a quest for a mythical healing plan in the early 1900s, while “The Revenant” depicts the Pacific-Northwest frontier of 1823 as white trappers and traders clash with the Arikara tribe. 8 Amy: A parable on the cult of celebrity by director Asif Kapadia, this follows the heady rise and fall of British singer Amy Winehouse. In an age where we are constantly prodded to “build our brand” and aspire to fame and being in the public eye, this tragedy shows how the pressure absolutely ruined this sensitive, unstable young woman. 7 Dheepan: Jacques Audiard makes the cut yet again, following “A Prophet” and “Rust and Bone,” with this Cannes Palme d’Or winner. “Dheepan” gets beneath all the political rhetoric about migrants to simply show the plight of three Sri Lankans trying to survive in a gang-infested French housing estate, posing as a family to gain refugee status yet gradually becoming one. The last reel gets a bit too “Taxi Driver,” but Audiard’s skill in building a story out of fragments, reaching an emotional conclusion while avoiding the sentimental, remains unparalleled. 5 The Big Short: As the stock market giddily soars after the election of Donald Trump, with Goldman Sachs boys bum-rushing the White House and the prospect of further deregulation, we’d do well to remember the crash of 2007. Director Adam McKay manages to take his topic of convoluted financial fraud and render it crystal clear, with something like the gangster swagger of “Goodfellas”. Amusing and informative, a rare feat. 4 Hypernormalisation: This documentary is exclusive to the BBC iPlayer, but find it where you can. Director Adam Curtis ironically employs dry “voice-of-god” narration over a free-associating cascade of BBC archive footage to examine the “post-truth” world we find ourselves in. Curtis manages to take everything that seems wrong about 2016 — Trump, Brexit, Assad, the “Facebook bubble” — and meticulously trace the threads back to 1975. Neither left nor right, this is more like pure, head-clearing cynicism. 3 The Knick: I could have picked “Fargo” or “Better Call Saul,” but this Cinemax series — which only just appeared on Hulu.jp — reflects how much the audience for intelligent drama, abandoned by cinema, has migrated to TV. Directed from beginning to end by filmmaker Steven Soderbergh, “The Knick” stars Clive Owen as a pioneering, morphine-addicted surgeon in 1900 Manhattan; its themes of technological disruption and ethnic grievance seem eerily prescient. 2 Room: The fear, in this connected age, that you can go off the grid and disappear, is at the heart of “Room.” The Best Actress Oscar win for Brie Larson was well-deserved, and director Lenny Abrahamson is showing great promise, as this was a strong follow-up to his flaky indie “Frank”. I’ll say it again: Don’t read anything about “Room,” just see it, for it lands a mighty sucker punch. 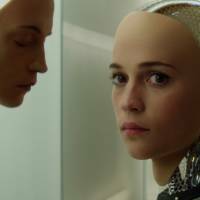 1 Ex Machina: The AI dreams of Silicon Valley writ large in director/writer Alex Garland’s re-imagining of the Frankenstein myth, which delves into the oncoming Singularity and the sexual fetishization of technology. Oscar Isaac is every ego-driven “mine-is-bigger-than-yours” tech CEO ever, while Domhnall Gleeson is the “Gee, that’s cool” technophile who begins to sense something is terribly wrong. 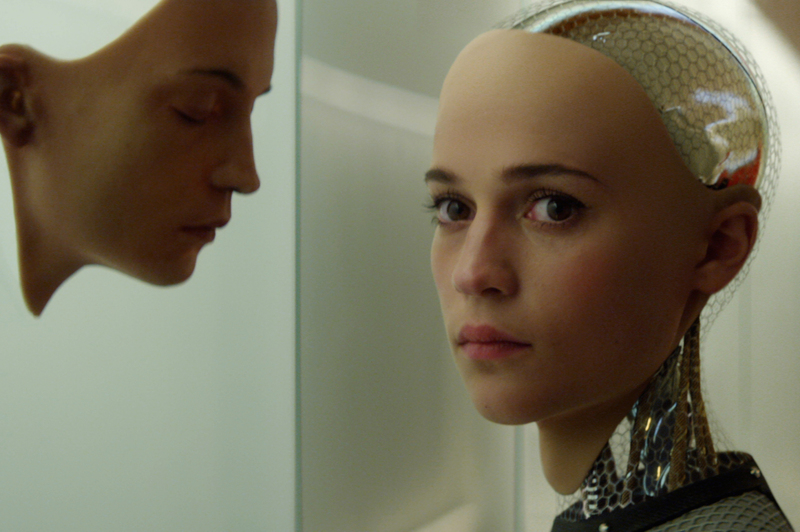 Kudos to Alicia Vikander for her inscrutable performance as the fem-bot.